Hover over image and press the X to enlarge. 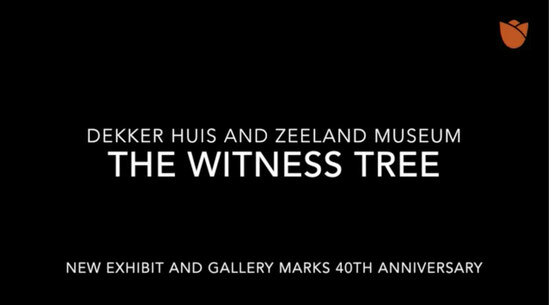 No one has seen more Zeeland history than, perhaps, the Witness Tree. The new exhibit of the newly refurbished Dekker Huis and Zeeland Historical Museum speaks for itself. The white oak was planted in 1840 when Washington Avenue was just an old American Indian trail. Seven years later when the first white settlers came to what would become Zeeland, the tree was a sapling, sparing it the fate of becoming lumber to build a log home. 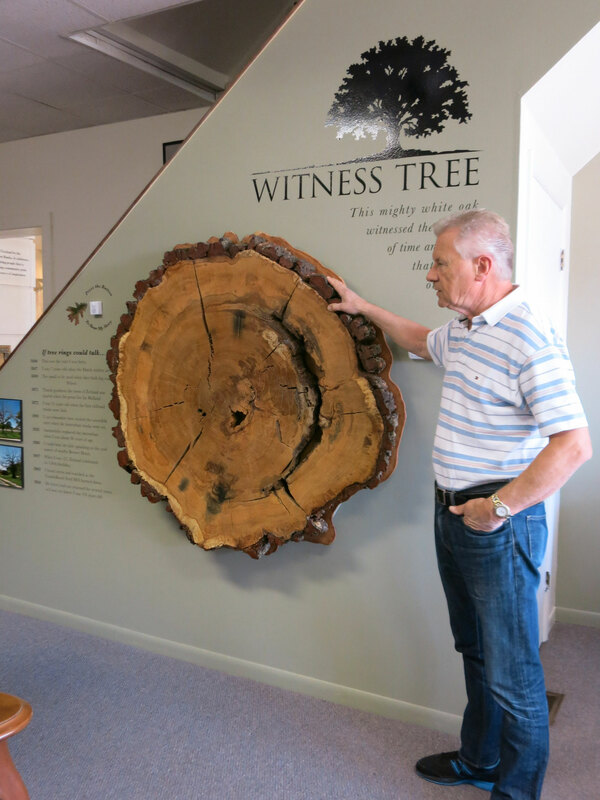 At nearly 4 feet across, the tree’s 174 rings have seen the country’s bicentennial in 1976 and the town’s sesquicentennial in 1997. The Interurban train tracks from Holland to Grand Rapids ran a few feet from the tree’s roots. “Someone placed a picnic table nearby so travelers could stop and have lunch in my shade,” the tree says in its “own words,” its voice lent by another museum volunteer Robert Boehn [Boehm]. The new exhibit and the renovations mark the museum’s 40th anniversary and the first major renovation in its history since the purchase of the New Groningen Schoolhouse in 2005 and renovation four years later. An open house and ice cream social Thursday, Aug. 18, will mark the anniversary with extended museum hours of 10 a.m. to 8 p.m., tours of the new space and, of course, ice cream. The historical society formed in 1974, but had no place to display treasures of years past until two years later, in 1976, it moved into 37 E. Main Ave., creating the Dekker Huis and Zeeland Historical Museum. Seven new panels with photos from the museum archives cover one wall. They detail the history of transportation, Zeeland Hospital, traditions — then and now, business and industry, Chix and Dux and historic homes. A a 9-piece dining room suite manufactured by Colonial Furniture of Zeeland also occupies the space. 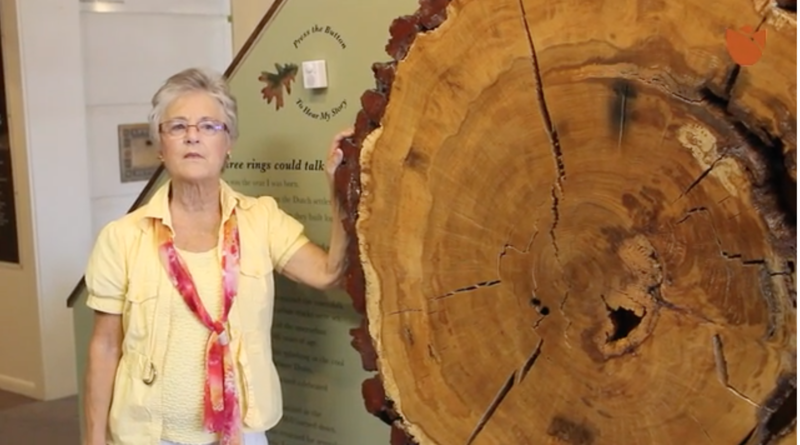 But it’s the tree slice people gravitate toward, Museum Manager Suzy Frederick said. Over the past two years, museum volunteers have been updating exhibits and overhauling the research room, including a digitalization project. Many documents or descriptions are available at zeelandhistory.org. Just as the Zeeland Historical Society considered renovations to the main gallery for the museum’s 40th anniversary, Keith Boonstra was considering history himself. As a teen, Boonstra worked in his father’s business Zeeland Wood Trimming Works, 600 E. Washington Ave., and admired the nearby tree. He grew up to run the business, now known as Zeeland Architectural Components, but never lost his admiration of the beautiful oak. By the time the tree was nearing its 170th birthday, fewer and fewer leaves were returning to its branches each spring. Eventually, none returned. A couple of years ago, the entire massive tree was gone, cut down for firewood. “I admired it when it was alive. … It died, yet it was so gnarly and gorgeous, and I loved looking at it. I missed it,” Boonstra said. 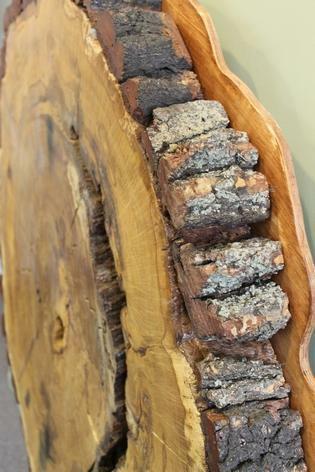 Visiting the stump, he thought museum volunteers would enjoy seeing the rings that had seen so much Zeeland history. That led to the idea that maybe a part of the tree should be given to the museum as a permanent gift. After a year of drying, the slice was coated and preserved and hung on the newly refurbished museum wall.